MONROVIA, LIBERIA: President George Manneh Weah has called for increased collaboration and coordination amongst the three branches of government in order to successfully tackle challenges facing the country and to meet the expectations of the Liberian people. Speaking Monday, January 14, 2019 during the opening of the second sitting of the 54th Legislature at the Capitol Building, the Liberian leader reminded the lawmakers that the government was elected by the people and is therefore under obligation to deliver on their expectations and meet their aspirations. He said Government can only succeed in bettering the condition of the people and transforming the country into a modern nation when there is collective effort and cooperation amongst those entrusted with national authority. “We must therefore work together to ensure that we deliver on the expectations of our people in all sectors of public service, particularly in the areas of education, health, infrastructure, peace, security and in agriculture,” the President asserted. He commended the lawmakers for the level of work done during the first sitting but urged them to increase their efforts this year so as to pass on critical bills pending before them. The President called on the lawmakers to strengthen their cardinal responsibilities—oversight, representation and lawmaking—in order to keep the national governance process on even course towards consolidating peace, security, development and prosperity. 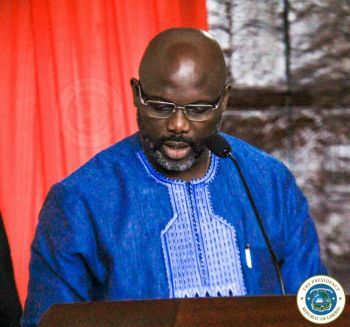 President Weah reemphasized the pivotal role of the National Legislature in Liberia’s democratic system, stressing that 2019 would be a very crucial year for his government in terms of consolidation of peace and taking Liberians out of poverty.